I’ve been bitten by the canning bug. I used to think that canning had to be a full-day affair, with pounds of fruit and showers of sugar and a clatter of specialized equipment.But lately many of my favorite food blogs have been singing the praises of small-batch canning: a pint or two at a time, perfect for using up the odd pound of fruit or experimenting with new flavor combinations. Small batches of jam also generally set beautifully without added pectin, and pectin was one of the things that put me off canning the most. I rarely eat jam, usually just a spoonful at a time, swirled into yogurt; I have no great interest in putting up a whole larder of preserves for the winter. So a pint of jam at a time is plenty for me. And now that I’ve started, I’m totally hooked. 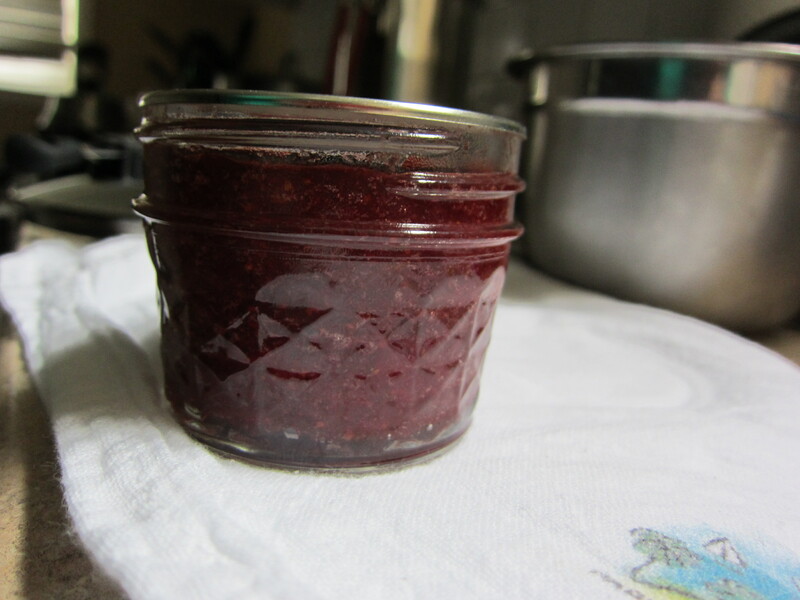 This particular strawberry jam recipe struck my fancy because it uses honey instead of sugar as a sweetener. As it turns out, strawberries and honey are a wonderful, slightly unexpected combination: cook them down together, and you get something rich and treacly and intense, yet with all the comforting familiarity of old-fashioned strawberry jam. I was originally going to add thyme, as per the source recipe, but the thyme in my fridge was old and furry, so I decided to skip it. The jam on its own is delightful, and I could imagine it providing an agreeable backdrop for any number of herbs. And as fabulous as it is now, in the height of summer-fruit season, I’m especially looking forward to smearing it on soda bread in the fall. I’m not used to summer rain. I’ve experienced it, here and there–spattery showers in the green Northeast, fast-moving tropical cloudbursts in Central America. But it’s not part of the rhythm of my life. I’m used to summer in the Bay Area as dry, yellow, a little hard, with stiffly moving breezes. Not the quiet humid trickle we’ve been having lately. This is June rain, and it feels weird–simultaneously soft and heavy. The clouds outside say soup and a blanket, but the stickiness on my skin says lemonade and a humming fan. It’s been making it hard to cook, when I come in from outdoors wiping sweat from my forehead, but within minutes I’m shivering at the gloom in the sky. There’s so much gorgeous produce at the markets, that needs so little done to it, and yet the weather is tricking me into wanting hot meals. 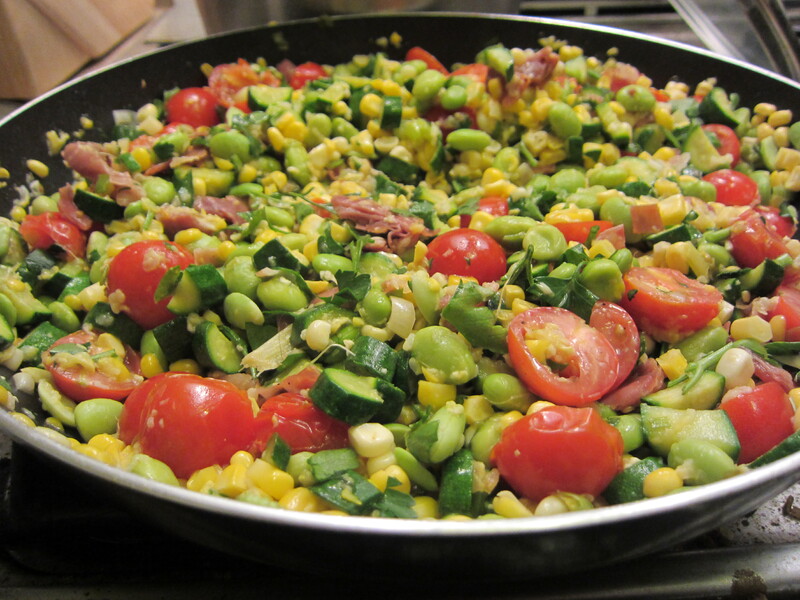 So here’s a compromise: a warm summer succotash, with zucchini and cherry tomatoes and corn-off-the-cob, with edamame and sweet onion, with big shards of parsley and ribbons of quick-fried ham. Everything gets quickly and simply cooked, until the tomatoes barely slump and the corn is just this side of raw. It’s a potpourri of summer textures, all sweet-crunchy and beany-soft and squash-squishy and tomato-juicy. Of course, this being a summer vegetable dish, it really shines with the freshest and best ingredients you’ve got–farmer’s market fodder, for sure. If you wanted to substitute fresh shelling beans (or favas, or limas) for the edamame, I’m sure you could; they might need a little longer cooking, but I’m sure they’d be lovely. All right. Time to let these cookies out into the world. These started out as a Nigella Lawson recipe that failed on me. I followed the recipe to the letter, and came away with a single amorphous cookie-blob on a baking sheet. Normally I would have just chalked it up to bad luck and let it go, but something about this recipe stuck with me. Maybe it’s the fact that it calls for three types of chocolate: melted, cocoa, and chips. Maybe it’s that I’ve never had a chocolate-chocolate-chip cookie that really lived up to my daydreams. Whatever it was, I had to perfect these cookies. Melted butter. I don’t own a stand mixer, and beating cookie dough with a hand mixer never goes well for me. So I always cream sugar and butter by hand, and that can make for wildly inconsistent cookies. 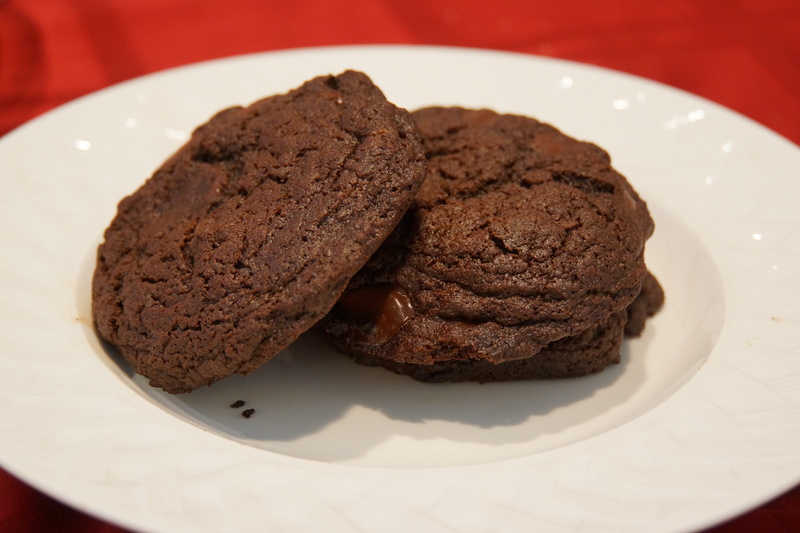 Melting the butter along with the chocolate solves this problem, and helps the cookies stay soft and yielding. It does, however, make for an almost alarmingly gooey dough, so soft that you may worry it won’t hold together when scooped. Trust me–it will. Size. I’ve tried shaping and scooping the cookies several different ways, and there’s no getting around it: bigger is better here. Larger cookies hold their shape better in the oven, are more resistant to overbaking, and yield a lovely range of textures: crumbly on the sides, crisp on top, soft and melting in the middle. I’ve had best results with my beloved #16 cookie disher, but you could also use a 2 oz (1/4 cup) ice cream scoop, as long as it’s got some sort of spring release mechanism. Temperature. You could certainly scoop and bake the cookies straight from the mixing bowl–they’ll spread quite a lot and become chewy-crisp all over. But if you have time, I highly, highly, highly recommend that you scoop the cookies in advance and freeze them. Just portion the cookies out onto a baking sheet, freeze them till rock-solid, then pop them into a zip-top bag and bake as many as you want, when you want, straight from the freezer. Baking the cookies when they’re ice-cold means they’ll spread less and rise more, yielding a tall and tender cookie with a crisp exterior and a luscious, fluffy center. Yum. Time. The cookies are best when baked until they’re just barely set–there should be a thin, firm crust on top, but the interior should still feel gooey and unstable. For my oven, the magic number is 12 minutes for fresh cookies, and 14 minutes for frozen. Once they’re out of the oven, let the cookies cool for at least 15 minutes on the baking sheet, so that the heat from the metal underneath can gently coax the interior to doneness. You want the cookies set enough to handle, because breaking into that pillowy interior is an absolutely glorious thing. And don’t worry about losing the fresh-from-the-oven magic–the cookies will stay warm for at least 30 minutes, and the chocolate chips inside will stay molten for at least an hour. Oh, and about that chocolate: don’t bother with the expensive stuff here. You’re going for big, brawny, chocolate-dense, nothing subtle or refined; supermarket chocolate fits the bill nicely. This is San Francisco, so I use Ghirardelli all the way–bars, cocoa, and chips. The cookies are still seriously indulgent. This post is really more about a technique than a recipe. Oh, the recipe is nice, too: a mellow deep-green pesto of spinach and scallions, a little onionier and greenier than the norm. I thought it up as a way to use up leftover scallions or scallion parts, hanging around after recipes that call for only part of a bunch. 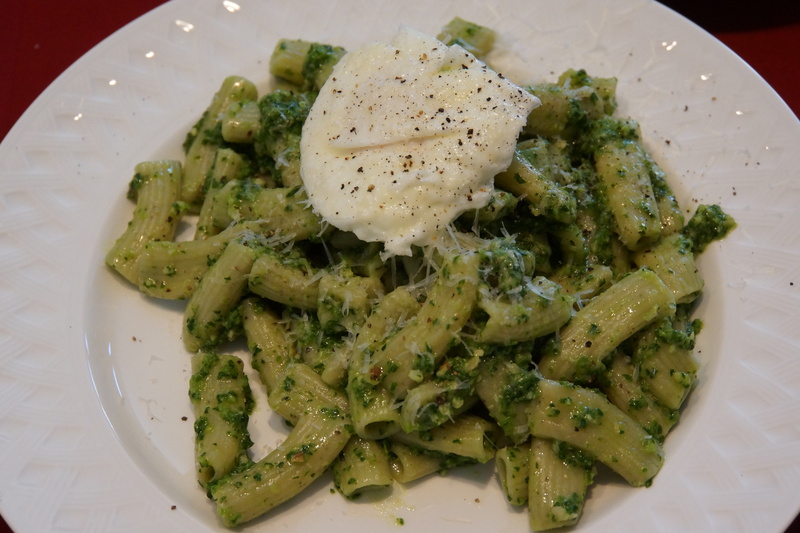 Sam and I ate our pesto over pasta, with poached eggs–a simple, surprisingly filling summer lunch. It’d also be dandy as a sauce for simply cooked fish, or spread on flatbread or pizza. Just a good, solid, early-summer condiment. Normally, I make pesto by hand, using the largest knife I have and chopping in handfuls of ingredients at a time. I love making pesto this way, watching the piles of ingredients transform under the blade. But in this case, I had some strong scallions–just cutting them into rough chunks made me tear up. I didn’t relish the idea of chopping and blinking and sniffling for twenty minutes straight. And, in all honesty, I was hungry NOW. I wanted lunch faster than the knife and cutting board would allow. So I decided to cheat a little, by using the food processor for part of the process. This still isn’t your typical blended pesto–I just used the processor to chop down the solids into a rough mass, about the same as I would with a knife. I tested it for readiness the same way, by pressing a bit of it with my fingers to see if it held together. Then I scooped the finished mess into a bowl and poured over extra virgin olive oil, just like I do with the handmade pesto. The results were damn close to the handmade stuff–I missed a little of the nubbly texture, but it was still leaps and bounds lighter and more interesting than the oily, emulsified pestos that usually come out of processors. This is a neat trick to know, because it puts really good homemade pesto–the kind you can’t replicate with storebought–within the realm of the 10-minute meal. Plus, keeping the olive oil out of the processor entirely means that it won’t turn bitter from contact with the metal blades (which the extra virgin stuff tends to do). So not only is this a fancier pesto, it’s a better-tasting one too. Not bad for a cheater trick. We’re officially into summer party season, with the sunshine and heat to prove it. And that means salsa season. I don’t care where you are and who you’re with, good salsa and tortilla chips are never out of place. Especially if the salsa’s freshly made. 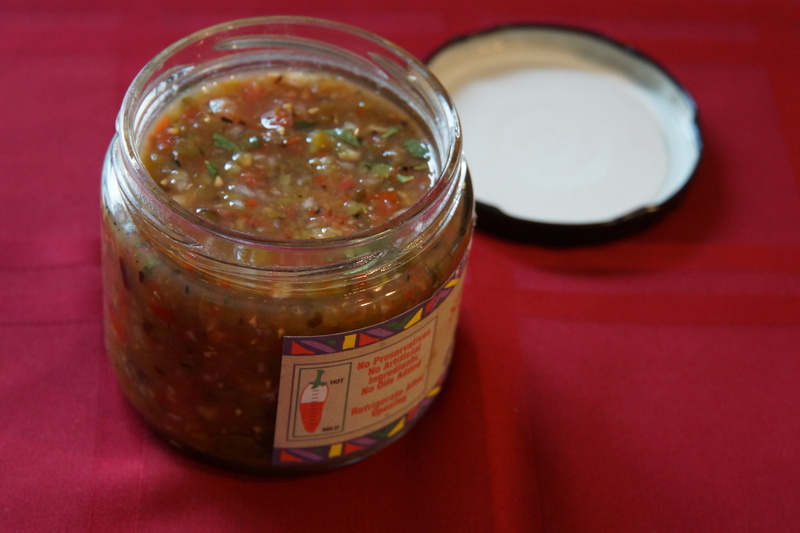 Usually, homemade chips-and-dip salsa means pico de gallo–tomatoes, onions, limes, a chile or two, maybe a little cilantro, salt, chunked and mixed. Nothing wrong with that, but it’s not my favorite. I tend to go for gutsier salsas, with a little more spice and smoke to them. And nothing punches up an ordinary tomato salsa like a roasted pepper or two. Or, in this case, three. The basic outline of this salsa is similar to the ubiquitous pico de gallo, but with a trio of peppery additions: green bell pepper for grassiness, poblano pepper for sharpness, and jalapeno pepper for fruity heat. I roasted my peppers under the broiler, which turned out okay-not-great; my favorite method is still straight-up roasting over a gas burner. (An outdoor grill would work too, if you’ve got.) As usual, the peppers are stripped of their seeds before going into the salsa, but in this case the blackened skin can stay–it’s where all the dark smokiness is. After that, it’s smooth sailing: a quick pulse in the food processor with some tomato, onion, garlic, lime juice, and salt, and hey presto–a loose, liquid salsa that clings appealingly to chips. As far as heat goes, this is not a beginner-level salsa. Straight out of the processor, it had a pretty solid kick. I liked the spice level, but several of my friends said it was just barely edible for them. As the salsa sat and mellowed in the bowl, the heat seemed to dissipate a bit, to the point that even my more spice-averse friends were able to dip a chip every now and then. But this is still not mild-and-friendly fare, so be prepared for a bit of a bite. The one downside of this salsa is that it doesn’t keep well. After about a day in the fridge, it loses its appealing freshness. But given how liquid it is, I’d imagine the leftovers would make a darned good marinade for chicken or pork. If anyone tries this, please report back. Several months ago, the lovely and talented Daisy over at Daisy’s World did a giveaway featuring hazelnut flour and polenta from Bob’s Red Mill. 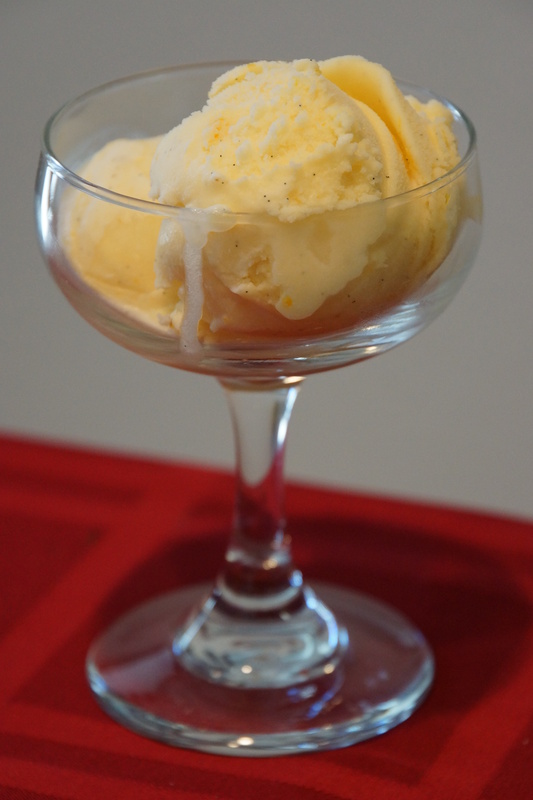 As one of the lucky winners, I was tasked with sharing a recipe using one of the products. I can do that, I said. The moment the box arrived on my doorstep, with my winnings tucked securely inside, I tore open the bags and went to work. I’m still working on finding a polenta recipe worth sharing–I slipped quickly into the tasty rut of topping it with crispy mushrooms and sausage, and haven’t deviated much since. The hazelnut flour, on the other hand, has gotten a serious workout. I’ve worked it into chocolate chip cookies, blended it into mole sauce, and used it as a crust for turkey tenders. 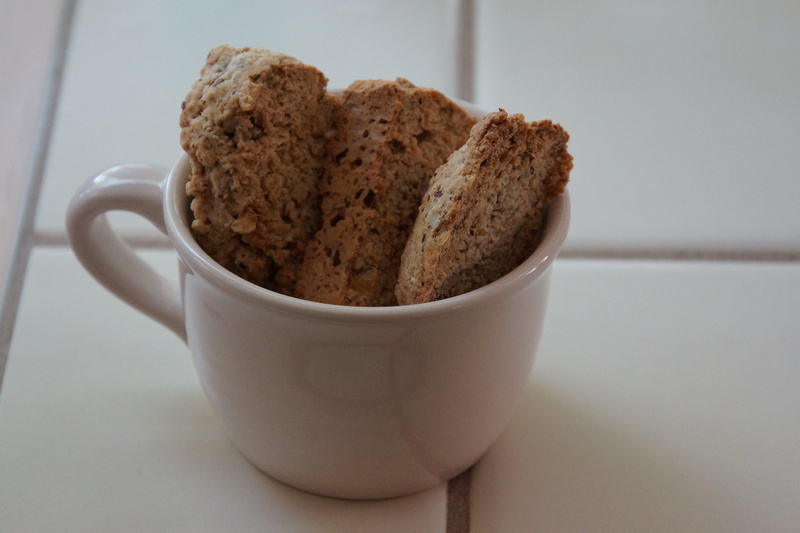 But I keep getting drawn back to the most unassuming recipe I’ve tried: hazelnut biscotti. They’re deceptively simple, these cookies, with the round richness of hazelnuts front and center. Unlike many biscotti recipes, which bulk up with butter, these rely only on the fat within the hazelnut flour itself. (Near as I can tell, that brings them closer to the spirit of the original Italian almond biscotti, which contain no added fat.) They’re pebbly-crisp and subtly nutty, with a breath of cinnamon for warmth and a kiss of orange zest for brightness. And they’re flecked with chopped hazelnuts–but finely chopped, almost invisible, not the massive tooth-testing nut-hunks you usually see in biscotti. “Biscotti” translates to “twice cooked,” which is where the cookies get their unmistakable shape and nubbly texture. First, the dough is formed into logs, and baked until it puffs and sets, almost like a cake. Then it’s sliced, breadlike, into thin flat cookies, which are toasted on both sides until they’re dry and crumbly all the way through. These work best when they’re formed small and sliced thin, for maximum crumbly crunch. Once they’ve cooled and crisped, you could dip them in chocolate, if you wanted to. But I prefer them naked. These are nice enough on their own, but they’re just about perfect with a cup of tea. Coffee or hot chocolate would work also, but good black tea is my favorite. Dunked in something hot and soothing, these biscotti make an ideal after-dinner wind-down.